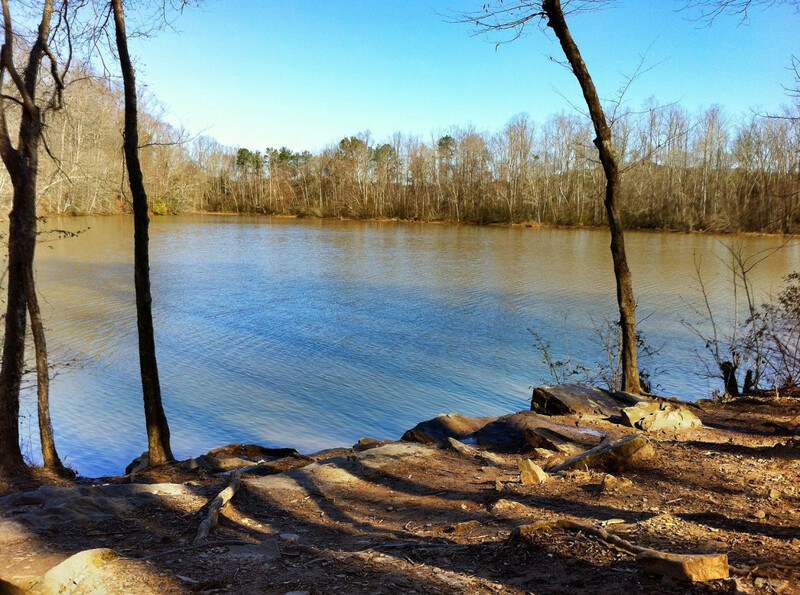 Gold Branch is part of the Chattahoochee River National Recreation Area, one of Atlanta's true gems. 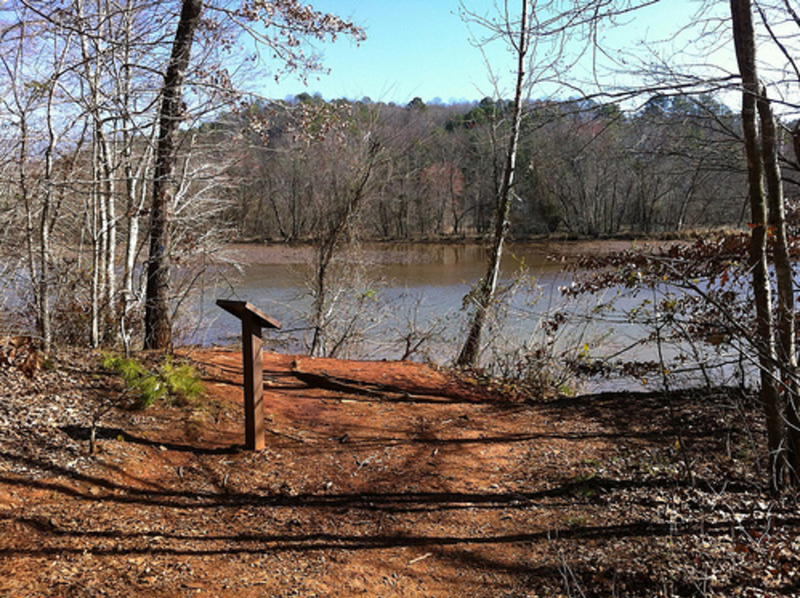 This is one of the more straightforward trail systems in the Chattahoochee River National Recreation Area. 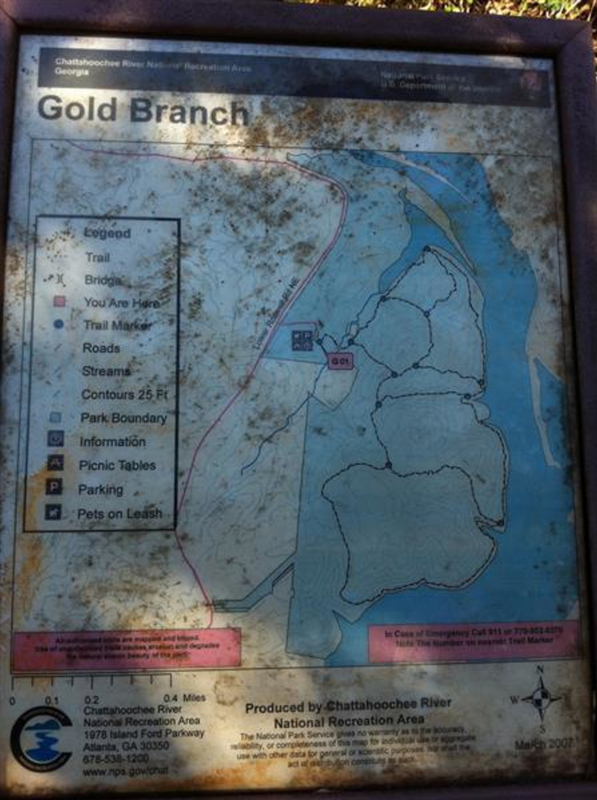 The longest loop is around 3.5 miles and wraps around the woods of Gold Branch Park. The trail begins with a gradual descent into a valley before flattening out by the lakeside. You gain and lose longer distances of elevation in the many cross trails that go east and west across the park, however the lakeside trail includes many short rises and falls. The highlight of this hike is Bull Sluice Lake, which seems to stretch beside you for a majority of your journey. The single-track path becomes rock-laden and rooted as it rises and falls in a roller coaster fashion alongside the lake, much how the water ebbs and flows to shore. The erosion on the trail reveals more of the tree’s root systems, which are now covered in moss. The closer the trail is to the lake, the more likely you’ll be evading rocks and roots, however these sections are few and the distance is short. If you hike after a rain, the north section of the trail and the creek crossings involve squishing through mud. Lush vegetation, ferns and cattails are plentiful at Bull Sluice Lake. This trail has some of interesting trees that stray beyond the stick-straight figures of their brothers. Many bend in odd directions, creating curves as they reach to the sky. Between GB 10 and GB 11, look out for the “bowing tree”, not an official name, but it mimics the look of a musician bowing from a standing ovation. Throughout your hike, many fallen trees line the path and some create natural arches above your head. When you come to the fork at GB 11, be sure to head west. About 0.3 miles from this intersection, the trail bends. Shortly after, take the side path a few paces west and you’ll reach the abandoned car. 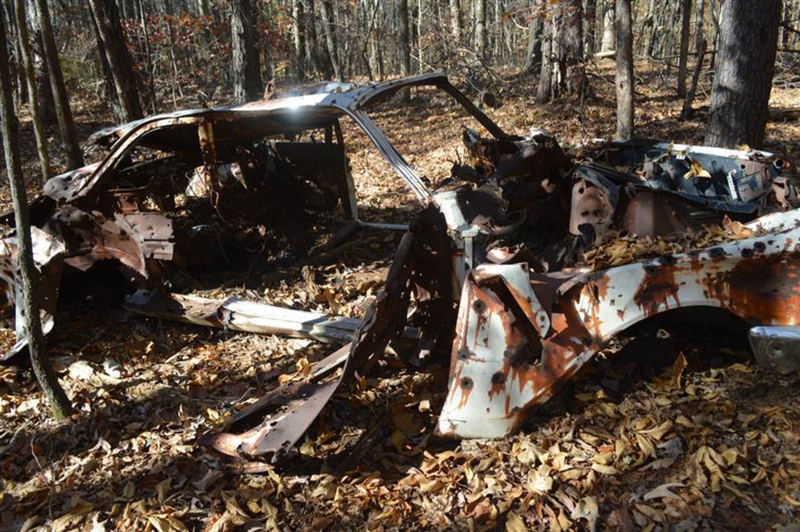 Rotted out and rusted with bullet holes in the frame, the haunting sight suggests a troubling event happened here. In the winter, it is easy to see the car from the main trail. As the trail drops in elevation, Bull Sluice Lake comes into view. When the trees are thinning from leaves, you can see this view at the top of the knoll. 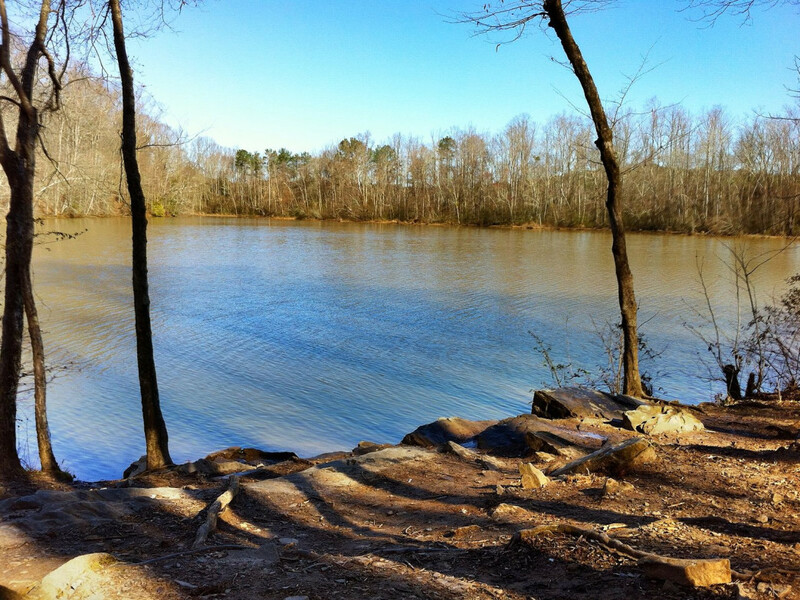 Once the trail meets with the lake, its serene waters are a welcome addition to your hike. Sun glistens off the surface, and in warm months you’ll see an abundance of wildlife such as turtles, herons and geese. At GB 9 and GB 12, the path curls around two of the lake’s calm coves. Dog owners will frequently send their pups into the water for a swim in these areas. Dog owners flock to this trail because of its simplicity and the ample amounts of opportunities for your pup to swim in the lake. The trails are dirt-packed and the distances are short, so they don’t wear on your pup’s feet. Also those hikers looking to “tune out” on a loop hike will find this the perfect no-frills experience. In warm weather, birdwatchers should bring binoculars to see the wildlife teeming by the lake’s edges. The Gold Branch Trail is easy to find- a simple right turn off Lower Roswell Road if you’re coming from the south. Note that the $3 fee is enforced at this lot, but unlike some of the other parking lots, you must pay in cash only. There are no public restrooms, just a port-a-pottie.